Oil on canvas, 67 x 115 cm. Instead of simply travelling to Southern Europe to study art, as most Danish artists did at some point in their career, Carl Rasmussen was one of the first Danish painters to visit Greenland. His encounter with the alien landscapes and culture made a lasting impression on the artist, who sought in his paintings to reproduce the country’s endless expanses, harsh climate and not least, the life of the local communities. 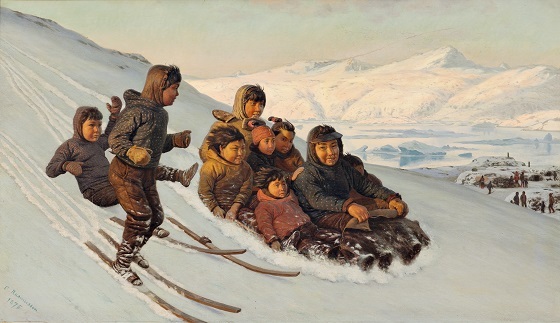 Rasmussen’s art was particularly ground-breaking in its portrayal of the lives of Greenlanders, where their everyday joys and sorrows were characterised with much realism and insight. In this painting he has captured a cheerful everyday moment where a group of children are speeding down a steep snow-blanketed hill on a sled and skis. One of the young skiers has lost his footing, while the other looks at the group in the sled, which is about to overtake them.